Volunteers maintaining hiking trail. 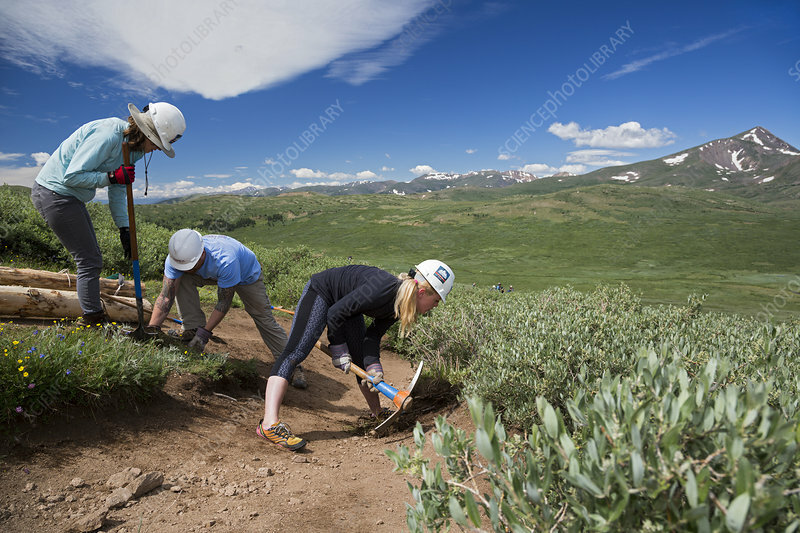 Group of volunteers working to maintain a hiking trail in a wilderness area in Colorado, USA. They are placing logs (waterbars) across the trail to stop erosion. They also closed off areas to prevent visitors trampling the sensitive tundra ecosystem. This trail is the Mount Bierstadt Trail in the Mount Evans Wilderness Area, near Georgetown, Colorado, USA. The volunteer group are part of Volunteers for Outdoor Colorado. Mount Bierstadt is part of the Front Range of the Rocky Mountains. Photographed in July 2015.